Camden had a major business in forging anchors of all sizes for boats and large ships. With waterpower to operate the hammers and forge, and easy access to water to transport incoming iron and the finished anchors, it was a niche metal working business, but a vital one for supplying anchors for the Maine shipbuilders. Without anchors, no sailing vessel put to sea. The business was best known as the Alden Anchor Works; by 1900, it had become the Camden Anchor -- Rockland Machine Company, according to the Maine Register. 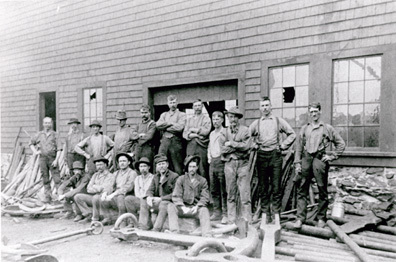 Here the work crew poses with examples of their work: anchors of various sizes and the rolled billets of iron that were heated and welded into anchors.